on Thursday 9th June 2016 – from 6pm at Project 24, Queen’s Parade, Bangor. 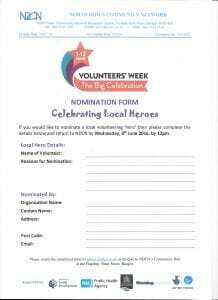 Please click on Nominations – NDCN Annl Vol Celeb 2016 or the JPEG below and complete a Nomination Form for each of your volunteering ‘heroes’. The forms should be returned before 12pm on Wednesday, 8th June 2016 – to the Community Hub in the Flagship (Main Street, Bangor) or by email admin@ndcn.co.uk. We look forward to receiving all your nominations, and to seeing you all on the 9th June. 6 Jun: FREE FactCheckNI Interactive Training @ NDCN – don’t miss it!